Apraxia Kids is pleased to announce the election of its new Board Chair, Sarah White! Sarah White is a nonprofit consultant with over 15 years of experience working in finance, administration, development, and communications for a variety of nonprofit organizations. As a consultant, Sarah guides nonprofit organizations through important stages of growth and change and assists them in setting up sustainable systems and structures so that organizations can focus on achieving their missions while being accountable to their supporters. Sarah is also the parent of a child with Childhood Apraxia of Speech (CAS) and is passionate about the mission and vision of Apraxia Kids. With full hearts, we reflect on the time, dedication, and commitment that Mary Sturm has showed as Apraxia Kids Board Chair for nearly two decades. Our organization would not be where we are today without the incredible love Mary had for her son that led her to tenacious action. We know that throughout her time with Apraxia Kids, Mary affected countless families on their journey. We wish her the very best in every future opportunity and know that she will remain a fierce advocate for children with apraxia of speech! Having the opportunity to serve as Board Chair for Apraxia Kids has been a joy and a privilege. Apraxia Kids began as a Listserv started by Sharon Gretz in the 1990s. I became involved shortly after its inception while searching for support for my son, Joshua with CAS. Parents from this online community began to meet in Pittsburgh. With the support of the local Speech-Language Pathologist (SLP community, the members of this parent group would become the core of a new nonprofit, Childhood Apraxia of Speech Association of North America (CASANA). CASANA, incorporated as a 501(c)(3) public charity in Pittsburgh in 2000. CASANA now operates under the name “Apraxia Kids” and has grown into the world’s largest and most respected organization serving families and professionals providing support to children affected by CAS. Apraxia Kids grew briskly over the last 18 years. Our first year, there were 3 of us, all volunteers, with an annual budget of $3500. I served initially as Board Secretary but have served as Board President for the last 16 years. 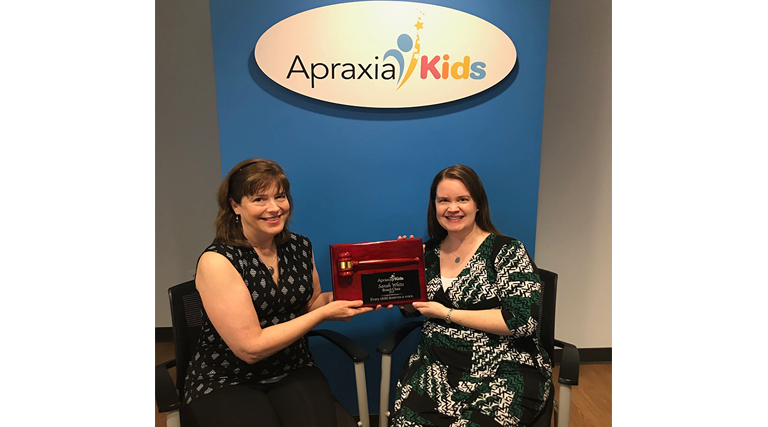 Apraxia Kids has grown in that time to a medium-sized nonprofit with 12 full time employees and an annual budget of 1.8+ million. We made 4 commitments to the Apraxia Kids community at the beginning. One: Apraxia Kids would be a collaborative effort between families, therapists, and researchers. Two: Apraxia Kids would provide the most reliable and up-to-date information for parents and professionals. Three: Apraxia Kids would operate in a fiscally responsible manner. Four: Apraxia Kids will be around for one hundred years to serve not for today but the future generations of children with CAS. Of course, we will not be alive to ensure this last commitment will come to fruition. That is why we have taken the process of transition so seriously and planned for our succession. The last 2 years have been a time of transition. In addition to expanding core programs: our social media presence, educational programming, intensive SLP training sessions, webinars, National Conference, Speech-Language Pathologist directory, speech tablet program, etc., we have taken the on additional tasks to ensure the succession of Apraxia Kids. We hired a new executive director, moved our offices, adopted a new brand, and began a new outreach program. Today also marks the first ceremonial passing of the Board Chair responsibilities to the next generation. I feel proud to be able to hand my gavel to such an incredible individual as Sarah White. Sarah not only has an MBA in Non-Profit Management, but also is a mother of a daughter with CAS. She has been an invaluable colleague, serving as Vice Chair this last year. I have learned much from her. I could not be leaving my gavel to a better person. Her integrity is impeccable and her passion for children with CAS is electrifying. My only question is, “Where were you when we started?” Congratulations Sarah! It is with great honor that I have accepted the role as Chair of the Board of Directors for Apraxia Kids. As a volunteer Board member for nearly two years already, I have watched this organization go through significant change and growth. Apraxia Kids is poised to support more of our children, their families, and professionals in this childhood apraxia of speech journey. Our staff and board have worked hard over the last 6 months developing a three-year strategic plan to further grow the impact of this organization. From outreach to school-based Speech-Language Pathologists, to our new website, webinar platform, and store, this plan outlines expansion of programs and campaigns to reach new audiences. I am excited to lead Apraxia Kids, in partnership with my fellow board volunteers and our amazing staff, as we work to achieve the goals set forth in this plan. Every child deserves a voice.